Hotels are so outdated. Airbnb let’s you rent rooms in anyone’s home around the world for a fraction of the cost of a hotel, or rent out your own place to visitors and make some money. The company now has a free iPhone app which beautifully complements the wonderful online website for its mobile users. The keys to success for Airbnb are twofold. It is simply beautiful to use and it creates trust and confidence in the transaction amongst both parties to ensure a clean transaction. Airbnb leverages the confidence of a community generated marketplace to let you find and or post almost any type of space for rent, and now available on your iPhone. 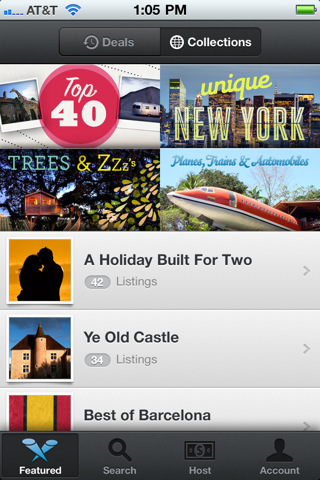 Airbnb iPhone app lets you find places by location with just a few taps and book them in no time. You can filter your search by location, price, check in/check out dates, and the number of guests. You can also then pick places by type like Private Room, Shared Room, or Entire Place. Once you find a place you want to book, you can message the host using the Airbnb app. Properies have a collection of owner uploaded photos, a host profile with community reviews and a list of amenities you’ll have access to like say TV, WiFi, Parking etc. A map of the place is provided and you can share the location by email, Twitter or Facebook. When you’re ready to book, just fill in the dates and view the cancellation policy. Then confirm and pay with your credit card. Wanna know how much cash you can make renting out your guest bedroom for the weekend? Maybe even your sofa? 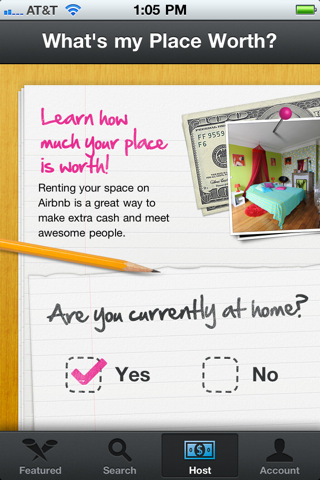 Start by getting a price for your place using the Airbnb process of valuing your property. Tap the Account tab and choose “What’s my place worth?” Once you are ready to go you can upload photos and post your place in the community where you will start getting requests in no time. Airbnb handles all the financial transactions and pay you after taking out 3% of your listing price. Airbnb also charges the renter an additional 6-12% on top of what you list your place for. You get paid from Airbnb via PayPal or Direct Deposit into your bank account, 24 hours after your guest arrives. In the Featured tab, Airbnb shows you deals for the day from around the world as well as collections of places to browse and get inspired by. The Upcoming tab shows places you are traveling to and or hosting soon. The inbox is where your communication to and from other members is listed. The user interface of Airbnb iPhone app is unbelievably attractive and unique and still very user friendly. Everything is legible and colorful, and the app even boasts some technically groundbreaking design ideas. 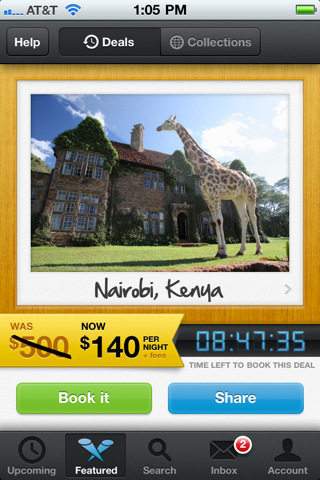 Airbnb is a must have app for travelers and property owners with an iPhone who use the Airbnb service. AppSafari review of Airbnb was written by Joe Seifi on November 15th, 2010 and categorized under App Store, Featured, Shopping, Travel. Page viewed 5578 times, 2 so far today. Need help on using these apps? Please read the Help Page.